Made of the finest non-toxic quality materials. Erases easily! Excellent coverage on blackboards and chalkboards. Twelve 3-1/4" x 3/8" sticks. 12 count. 97% calcium, 3% whiting. 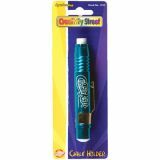 Holder allows full use of chalk stick up to 1/4". 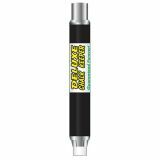 Accepts all 3/8" diameter chalk. Once loaded you never touch the chalk again! Practically indestructible. 3 7/8" x 1 1/16" diameter. 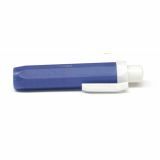 Easy-to-use chalk holders prevent chalk breakage and keep hands clean. Features handy pocket clip. Assorted colors. 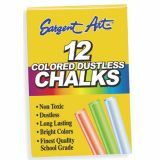 Includes one piece of standard size chalk, 3/8". Keeps hands clean. 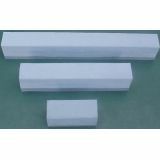 Holds standard 3/8" chalk, one pice included. Durable palstic with cushion grip and pocket clip. 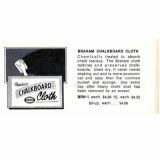 Chemically treated to absorb chalk residue. Restores and preserves chalkboards. Used dry, it never needs shaking out. 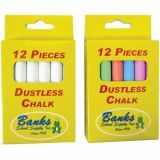 Use everyday after heavy chalk dust has been removed by an eraser. Lasts about one school year per room. Hold your chalk in style! 6 dynamic colors vac-metalized: pink, purple, green, black, or gold complete with clip that fits notebooks, pockets, belts and more. Non-toxic. Let us choose a color for you. Fits standard board chalks. Holds all standard chalk. Guaranteed forever. Highest quality all steel design & construction. Black & chrome.